Compare car rental rates for Larnaca, in Cyprus. Cheaper Larnaca Airport vehicle hire, like minivan & SUV. 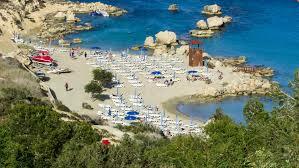 Compare and book cheaper car hire at Larnaca Airport in Cyprus. We offer Budget and Sixt as our main suppliers, but at lower than published prices. Larger and specialist vehicles like convertibles, SUV or MPV, can also be booked here, at much cheaper prices than if you hired after you landed at Larnaca Airport, or went direct. Rates include mileage, breakdown, insurance. Larnaca Airport, along with Paphos Airport, are the main air gateways to the small sunny island of Cyprus. A small, one terminal airport. which is very busy in the summer months and serviced mainly by charter flights such as Thompson Travel. Larnaca Airport is just 6km from Larnaca city. You can stay at one of the many hotels in the town itself, or at one of the hotels that ring the scenic bay. Once you have unpacked from your flight, and parked your hire car in the hotel car park, why not take a walk around the town. 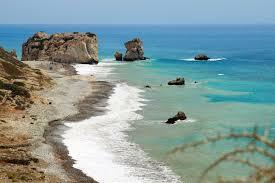 Situated on the sun rich east coast of Cyprus, Larnaca is a top tourist destination within Cyprus. This is the ideal retreat if you just want to enjoy the sun, sea and relax with first rate accommodation and plenty of activities to keep the kids happy. The beach is long and fringed with palm trees. The picturesque marina is perfect for evening strolls. If you have a rental car or a bike, then pack your bags. Spend a day at the Salt Lake, just out of town. This lake is famed for flamingos that nest there during the winter months. Further out of town in Kai the Angeloktisti church is home to rare 6th century Byantine mosaics. 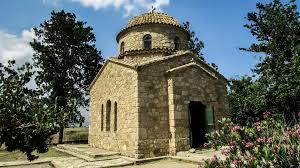 To the north of Larnaca lie the Mycenean ruins of Kition, which makes for an educational and rewarding day out. Compare and book cheaper Larnaca vehicles to rent. 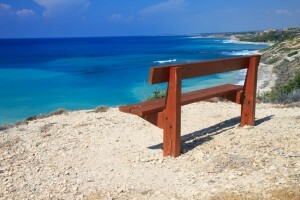 Renting estates and minivans made simple in Larnaca. 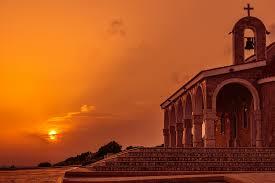 Get SUV and MPV in Larnaca Airport for your travels. Angeloktisti Church - Further out of town in Kai, the Angeloktisti Church is home to rare 6th century Byantine mosaics. 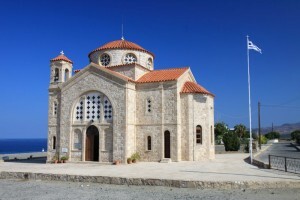 Then drive to the north of Larnaca, where the Mycenean ruins of Kition makes for an educational and rewording day out. Ancient Kitium - Dates back to around the 13th century BC and has lots to offer the inquisitive tourist, making it a major attraction. Leave yourself plenty of time to get parked and enjoy the many historic buildings and landmarks on offer. 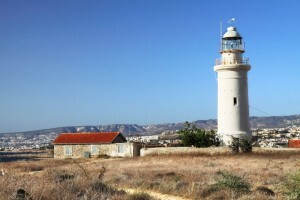 Use this, Larnaca Walking Map to print a map of a recommended walk around the town. Taxis are cheap and may be the preferred transfer option to you hotel or holiday villa. The other option, particularly if your villa is located a distance from the nearest town, is to hire a rental car, which is fairly cheap. There is ample car parking in front of the terminal. If leaving for long time it can work out expensive, as it is a flat hourly rate for both long and short stay. Parking for the disabled is reserved close to the Airport entrance. Compare car hire rates In Cyprus and Greece.